Screwtape Studios' aim has always been to eventually create story driven, immersive games. Trojan is our first foray into the larger games that were the inspiration for buildig a new game company. Trojan was born from the mind of Anthony Wood, creative director and was expanded and extended together with our Narrative Designer, Ben 'Yahtzee' Crowshaw. After three months of story, character and puzzle development we applied to Screen Australia for the last round of the Digital Ignition pre production funding, and two months later we were awarded with a grant to start creating our proof of concept demo of Trojan. So how did Trojan become the game that we are creating today? Many decisions first needed to be made about the style, genre and mechanics of the game. There were multiple reasons for designing Trojan as a point and click adventure title, most of which comes from Anthony and Megan's seperate loves of 'old school' adventure games. Anthony's top three are Liesure Suit Larry (original), Space Quest 1 and Kings Quest 3. Megan's top three consist of games from the Kings Quest series (Don't ask her to put them in order of Fav). The pacing and exploration of the old adveture games has infuenced thedesign of Trojan as well as the story. ScrewtapeStudios was built on the idea of eventually making games with rich and relevent stories. Both Anthony and Megan have had a long a long love affair with film, literature, acting and theatre which influences the stories they want to tell in the games they create. The best friends met in theatre school and even the company's name was inspired by a C.S.Lewis book. How long will the full game be? Not only do the devs at Screwtape Studios love adventure and story driven games but they also have full time jobs, relationships and very little time to play longer titles! Because of this fact, Trojan will be a short form game, though with the same feel as a larger and longer one. What to look forwad to in Trojan? Look forward to meeting ODY and helping him follow his journey to understand the humans of his ship, The Penelope, as well as maybe helping him realise his place in the universe, along with everyone elses. Bank Job Android Gets 5/5 review! Bank Job iOS update is Live! Bank Job has received it's first iOS update! Look out for some free goodies! Bank Job Released for Android! 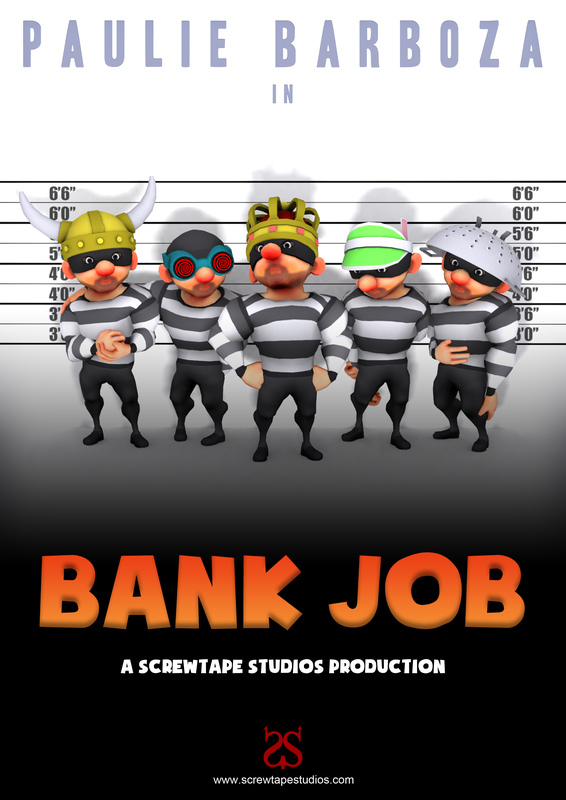 Screwtape Studios latest game Bank Job has been submitted and is now ready for download on Android Devices. The much anticipated new game from Australian Devs, Screwtape Studios, is now available for download!